Tell us a little bit about your background. How did you did you first become interested in engineering? Growing up I had always been interested in how things worked and getting dirty. I enjoyed helping my Dad around the house and loved taking things apart. I didn’t know that engineering was something that was possible for me until I started school at Mass Maritime Academy. I enrolled with Marine Safety and Environmental Protection as my intended major, but after spending a semester on Sea Term, I instantly fell in love with the Engine Room and declared Marine Engineering as my degree with a Mechanical Engineering concentration. After shipping out in the Merchant Marines for 6 years, I came shoreside and found a place with Veolia (then Dalkia) where I have been able to continuously progress; starting as a Junior Project Engineer to now a Plant Manager. What goes on at a Veolia plant? And what do you do as plant manager? At my Plant, we are the complete O&M service provider for a Cogeneration (Cogen) Facility at a major biotech facility in Cambridge. The Cogen is a 24/7/365 operation that supplies the campus with steam and electrical utilities. As the Plant Manager, I lead a crew of 4 operators and 1 Operations and Maintenance Supervisor to ensure all the equipment is functioning and available while staying in compliance of all site, state, and federal rules and regulations. I work with my crew to ensure 24-hour staffing, maximize efficiency, plan outages and budgets, and basically keep the heat and the lights on. We have as our main equipment a 5.2 Megawatt combustion turbine with an integral heat recovery steam generator and 2 watertube steam boilers. As the Chief Engineer, I am responsible as the MA Engineer-In-Charge to follow laws and codes set forth in the MA General Laws. Do you work with many other women on a daily basis? 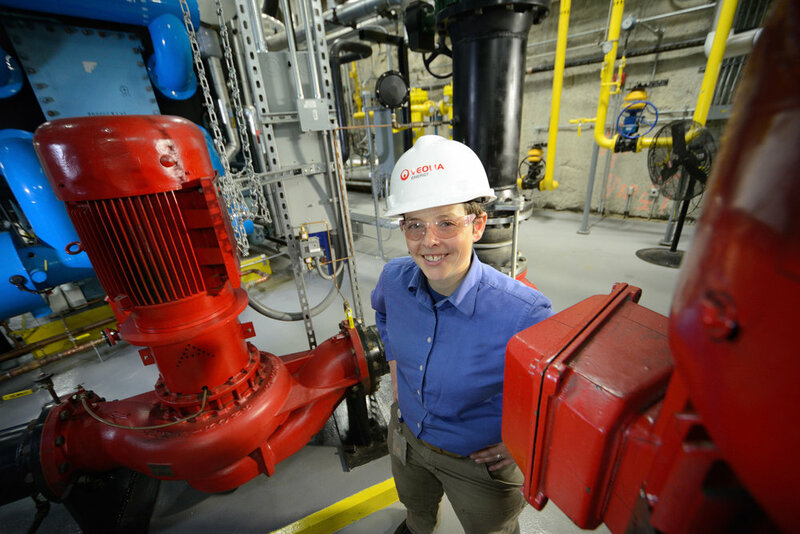 I work with many women, but only one other woman in Engineering; she is with Biogen Facilities and is also a Mass Maritime Alumni! After years of feeling as though you had to “earn respect” from your male colleagues at past jobs, how did you finally gain confidence? It’s still a daily battle to feel OK with being confident, but from the start my theory has always been that I never ask anyone to do a job that I haven’t personally done. I encourage and welcome questions from my crew and hope that through my knowledge, experience, and mutual respect that I have earned theirs in turn. What advice would you give to young women pursuing engineering careers? Be open to every learning opportunity and believe in yourself. Find others who believe in you as well and never get complacent. The great thing about this industry is that you can learn something new every day; all you have to do is pay attention. Is working for an environmentally-focused company important to you? Definitely!! To that end we are continually looking for ways to minimize our impact on the environment; Veolia and our biotech partner have strong commitments to sustainability and have allowed us to enact many projects here with that goal. 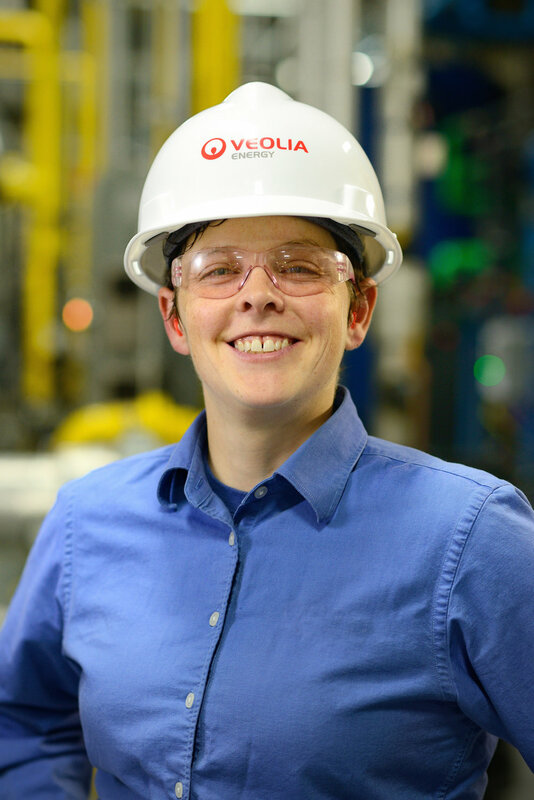 I am honored to presently be participating in Veolia’s Women in Leadership program, where I hope to hone my management skills and continue to improve myself. I am also looking to test for the CEM(Certified Energy Manager) designation this summer. In my personal life, I am working with the members of the all woman swing big band I am in to incorporate as a non-profit as a member of the board of directors.